It’s time for some education with Northwest Rapid! To help you introduce your children to 3D printing, here’s a helpful guide from our Engineer, Chantelle. 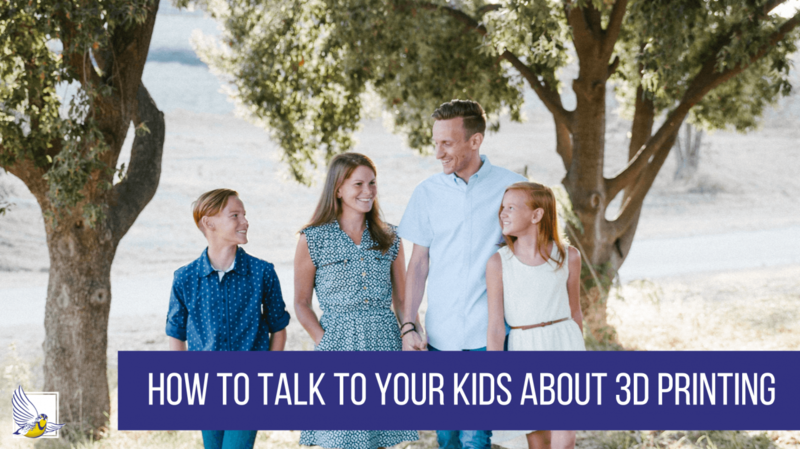 When it comes to many of those difficult parenting conversations, we can often draw from our personal experiences to frame the talk. Drugs… well, it’s ok to admit it, we all experimented in college. “The Birds and the Bees?” If you’re a parent, odds are you have knowledge around THAT subject. But 3D printing? Where does a parent go? What resources are trustworthy-and accurate? RE-lax! Auntie Chantelle is here to help you through this difficult conversation! My handy-dandy 3D Printing Primer will guide you with ease through this confusing and challenging tech in your child’s life. First, let’s talk about the appropriate age to broach this subject. Of course, if your child comes to you with questions, consider that an opening and address it. If they don’t, then I would suggest waiting until they are exposed to STEAM classes at school. You don’t want to push, but you don’t want your child left behind and possibly becoming the subject of ridicule by the children of professional nerds. 3D stands for the 3rd dimension. Generally speaking, it’s referred to as “depth”. Let’s look at a couple of shapes. This is a square. 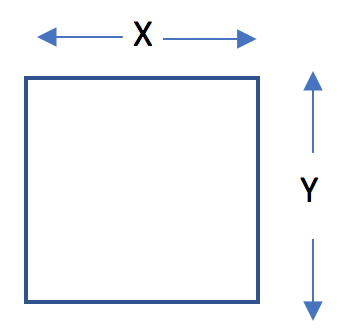 A square is 2D, having an “X-dimension” and a “Y-dimension”. 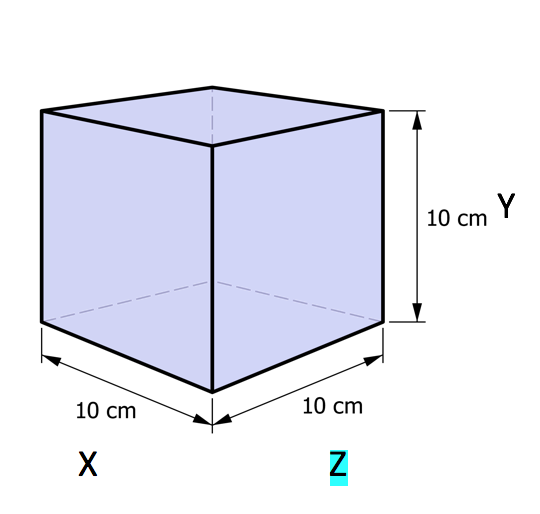 This is a 2D rendering of a cube, which is a 3D object. It has an X-dimension, a Y-dimension, and a Z-dimension. It’s that Z that is the 3rd dimension, the “3D” in “3D Printing”. Thinking about it another way, it’s the difference between a painting of the Easter Bunny and a chocolate Easter Bunny. If you turn over the painting, you see the back of the canvas. If you turn over the chocolate Easter Bunny, you see his tail! And then you bite his ears off! Yum! What IS 3D Printing, AKA Additive Manufacturing? To continue with the bunnies, let’s first contrast 2D printing with 3D printing. 2D printing would be making posters of our Easter Bunny painting. It’s a flat picture copy of the original, suitable for framing. 3D printing would require first making a 3D CAD file (more on that later) of our chocolate bunny, either by drawing it in a software program or by making a 3D scan of the actual chocolate bunny. Secondly, that 3D file would then be put into the computer of a 3D printer. The file will be “sliced” into little tiny layers, and the printer will create those layers, one at a time, out of the material that you have chosen (there ARE chocolate 3D printers now, BTW!) until the bunny is replicated. Additive manufacturing is a process of making a three-dimensional solid object of virtually any shape from a digital model. Additive manufacturing is achieved using an additive process, where successive layers of material are laid down in different shapes. Additive manufacturing is also considered distinct from traditional machining techniques, which mostly rely on the removal of material by methods such as cutting or drilling (subtractive processes). Before we can make a 3D print of anything, we must have a computer-generated 3D model. When I use the word “model” here, I am talking about a computer file, not a physical object in the real world, like a model car or a statuesque blonde. We must have data from all 3 dimensions to make the 3D object. That’s why the scan of the necklace in that heist movie was silly… how were they able to make the backside of the necklace without information on what the back side looked like? Ah, Hollywood. But I digress. This is why I can’t scan the painting of the bunny and make you a bunny with a tail. There’s no tail in our painting. So, what do we do? There are many more out there, and a quick search (here is a good place to start) should provide you with programs to research. I strongly suggest that you go with a program that allows for an STL format, as this is the industry standard file for 3D printing. You’ll see the term “CAD” a lot. That stands for “Computer Aided Design” and that just means that you used a computer to make the drawing/model, instead of a pen and paper. It does NOT necessarily mean that the drawing/model is 3D, though. There are 2D CAD drawings also. 2. If your object already exists in the real world (for example, the chocolate bunny), we can have a 3D scan made of it. Instead of trying to pretend that she knows how this works well enough to explain here, Auntie Chantelle is going to defer to these people who seem to know what they are doing. For 30+ years. Those two options are it, currently. Choice 1 or 2. Now we talk about what you want to make your object out of, which will probably dictate the type of printer you will use to make it. This is one of those annoying questions that must be answered with another question, and that is: What are you going to DO with this thing? Because that will most likely determine your material. Your decision on material will guide you to the technology to use, AKA the kind of 3D printer your part will be made on. This is because most 3D printers are specific to a certain kind of material. 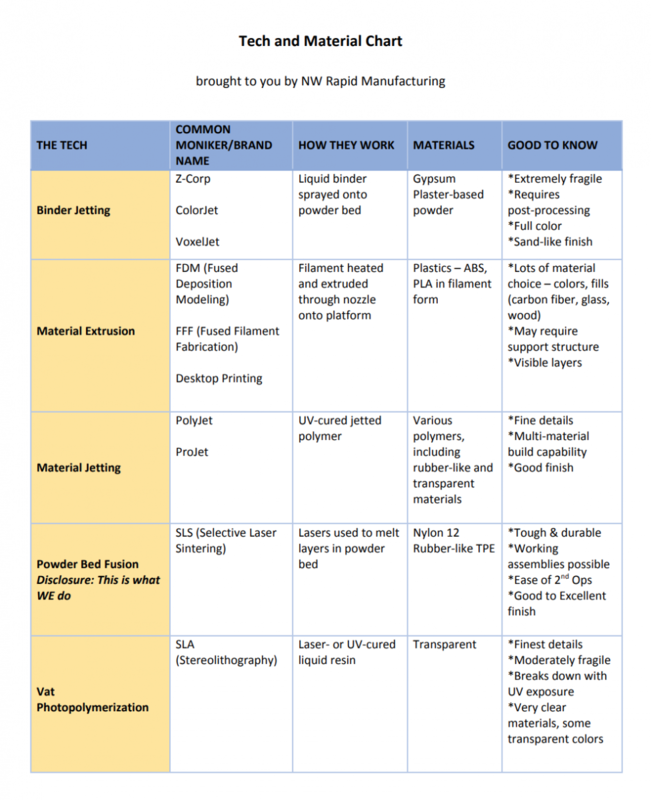 To keep it simple, I made a table and I’m going to focus on 5 of the most prevalent technologies out there: binder jetting, material extrusion, material jetting, powder bed fusion, and vat photopolymerization. 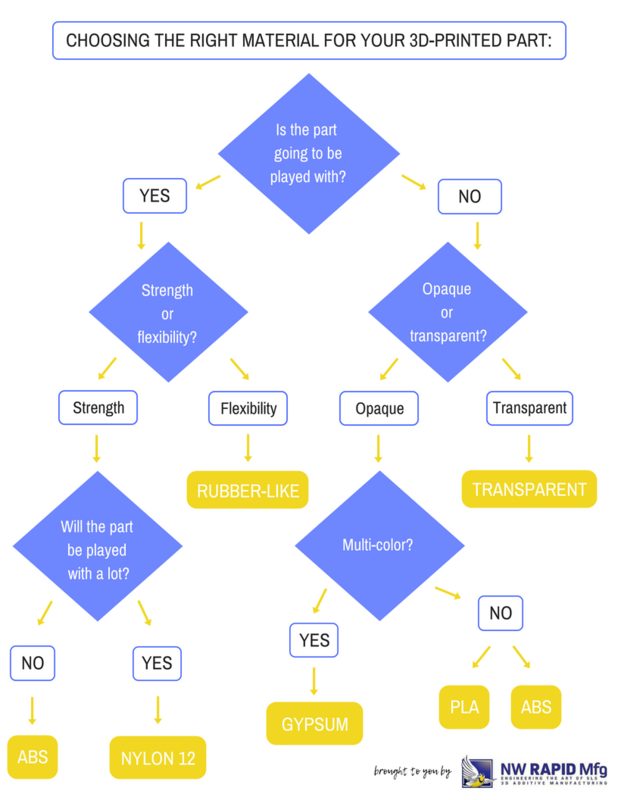 I will limit the materials to the 6 from the flowchart above: Nylon 12, ABS, RUBBER-LIKE, TRANSPARENT, PLA, & GYPSUM. The Technologies: What they are called in the marketplace, what they do, and which flowchart materials they use. Now you should have a good idea of what kind of 3D Printer you want to use to make your part. These providers have online quote forms, so you can upload your file, choose your material and quantity, and get a quick quote. Another option is to search for a provider that offers the material/tech you want. These may be smaller service bureaus that can provide you with more customer service (like pre-print file review, material suggestions, etc.) but may cost slightly more. Once you have a provider you want to work with, warm up your credit card, place your order, and sit back while some amazing technology and helpful professionals manufacture your part! As an industry “insider”, there are a few tips that I would like to impart. Find out where the printing is happening. There are brokers out there that seem like they have their own machines but may have things (or some things) made elsewhere. It’s a fairly common practice, and there’s nothing wrong with it, but it may increase your cost to use this “middleman”. Get more than one quote. How bureaus price varies widely. Try some big and some small bureaus. Read the Terms and Conditions of Sale! Few large bureaus will review your file for errors or printability, but most bureaus (large and small) will state that they “Print to File”. This means they print what you send them and if it’s messed up and it doesn’t print correctly, that’s your bad and you bought it, either way. Bear in mind that returns are not normally offered. Reprints can only be expected if the bureau’s machine malfunctions. Remember, you are asking for a custom, one-of-a-kind object. Returns are rarely a thing. Dream big, but be practical. 3D printing isn’t magic and you can’t make anything and everything. Be open to suggestions if a 3D professional is offering to help you get a better end result. In the end, the important thing to remember is that your child’s curiosity about 3D printing is natural. Whether they decide to engage in 3D printing behavior – and whether you allow it – needs to be a personal choice. I hope that my handy-dandy 3D Printing Primer will give you a firm foundation from which to guide these important life decisions. Don’t hesitate to reach out if you need more support or have questions that have not been addressed here. Questions? Let us know! We’re here to help and can provide a quote, should you have a design or idea you’re ready to print.